I was sad to see my LA trip come to a close, but I was super fortunate for the time and miles I shared with the abundance of sunshine. It’s no joke; we really do get burnt out when we’re in one place for too long. My NYC winter experience, even after ten years, has proved to have finally gotten the best of me. I was delighted to have eleven (more like ten) days to treat myself to some exploration and humidification, ha. So I got up with the intention of swimming 3500yds, got to the pool, got in, and then a family arrived and invaded my space (not like I own it or anything, but it was going to be tricky to work around them for 1.5 hours). So within minutes, I hopped out and hung my suit to dry. BUT I do not give up! Believe it or not, when my work event was over at 9:30pm, I suited up again and knocked out about 3000yds before the pool closed. My co-workers thought I was insane, and the passersby were all amused, randomly clapping for me at odd moments. (I think they drank a few.) But I had the most peaceful experience in this midnight sky, in a bright blue pool, all by my lonesome. I was pretty proud of myself for getting in a workout so late in the evening. AND I slept like a baby. Bonus. Woke up with the hopes that I’d sneak in some gym time but that was unlikely given my late night rendezvous with the big blue body of water. But, even better, my friend Kelly picked me up at 8am and we got our coffee and made our way back over to Runyon Canyon. We walked quite a bit, getting breathy as we exchanged stories of life and took landscape shots. 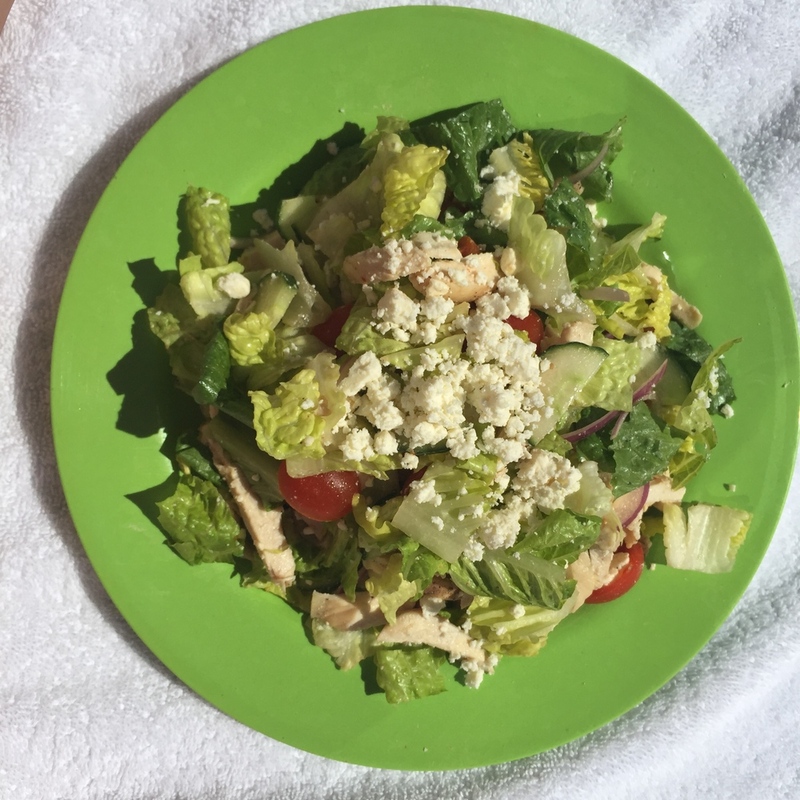 I knew this wouldn’t be enough of a workout to match my training plan, but I treated it like an active recovery day. Though that sounds like an oxymoron, these days are super important. They’re the days I don’t push myself too hard but I’m still working up a mini sweat, eating very healthy and getting plenty of sleep. Friday the thirteenth has nothing on me. I don’t even think it crossed my mind initially. I didn’t have much time this morning as I had a lot of work to do, so I tapped into my speedy side and headed to the hotel gym for a fartlek workout. I stretched, rolled, then got on the treadmill and got down to business. I completed three continuous rounds of a: 30-sec jog, 20-sec run, 10-sec all out, followed by several minutes of running, then kicked off the whole cycle again…4 times. It was a tough workout, especially on a treadmill but I knew time was limited and any type of speed work was crucial at this point in my training to keep me from plateau’ing. 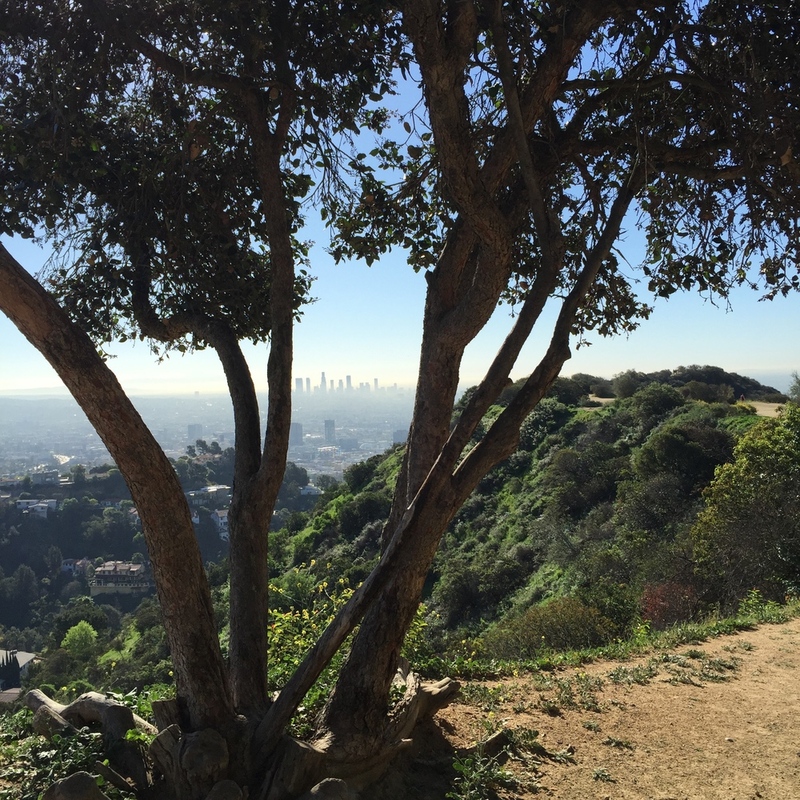 I had an itch to go back to Runyon Canyon, this time to actually RUN it. And so I did. This was by far the hardest workout of my trip. I was running in what felt like a vertical direction, at times unsure if I’d slide backwards. But among the walkers, I ran and ran, even if at a snail’s pace. I followed the general path most take but got adventurous with a few gnarly trails that were less frequented, curious of where they’d lead. Some parts were run-able, others skip-able and some I was literally climbing up with my hands and feet. Before I knew it, I was at the very top of the Canyon, staring down at Los Angeles and honestly scared of how the hell I would get down in sneakers, when I should have been in hiking shoes. And I won’t lie, I was sliding like a snake, really holding on for my dear life on some downhills, afraid that I would never make it down because I was so stubborn to keep going up. But my exploration was SO worth it, and it was quiet and the air so fresh. When I got off that Canyon, I ran back to the hotel and I was beat. It may not have been my typical swim, bike, run session but it used a lot of those muscle groups and triggered the trekkie in me that I totally could get used to. (I so want to start rock climbing all the time now!) Oh and then I had an awesome brunch with my bestie Erin. 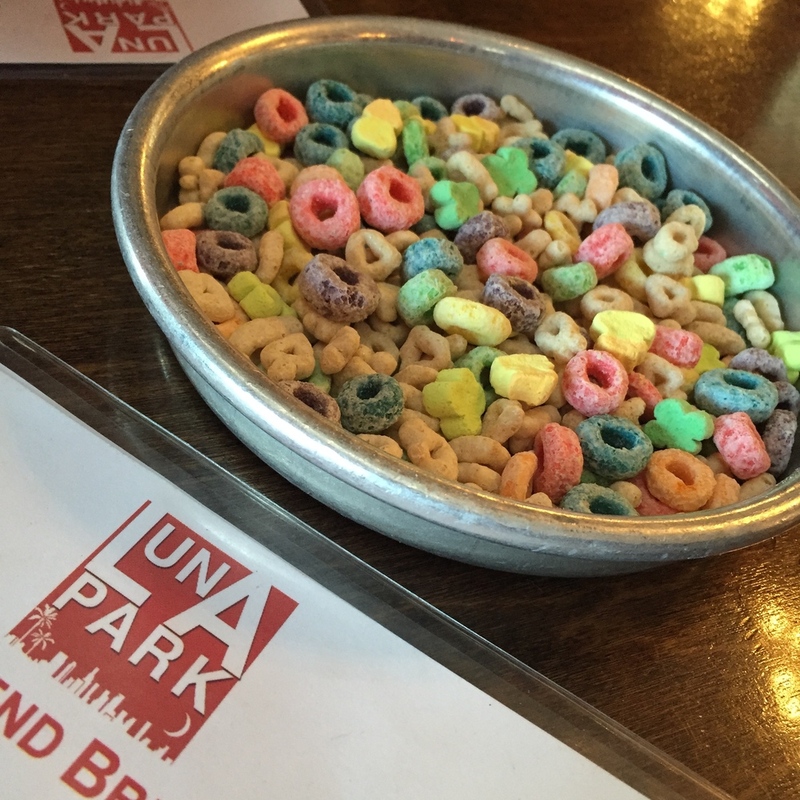 They served lucky charms and fruit loops as a starter! Though I wanted to explore the Santa Monica Pier, I knew today wasn’t the day. It was the LA Marathon! I ALMOST signed up for the half marathon but when I heard it would be in the 90s I was like JK. So to keep ourselves out of that road mess, my husband and I went back to the hotel gym and I knocked out a solid 2-hour BRick session. I hopped on a bike with a virtual coach and worldly views, grinding some serious gears to get me through the Irish countryside. I kept it challenging for a full 90-minutes, working between 80-100% effort for most of the ride, and then hopped on the treadmill and knocked off 3.5 miles, running at about a 9min/mile pace. I felt really strong and ready to spend the rest of the morning/early afternoon by the pool for some R&R before our final two events. As happy as I am to be back in NYC (in warmer 40-degree temps!) I’m still contemplating how I can live a bicoastal life. The explorer in me is definitely itching for something new. Cali, thanks for the fresh air. See you soon?